The next step is adding the radius to the fretboard. We need to use the drum sander to bring the neck down to the desired thickness. I use 1 inch from the back of the neck to the top of the fretboard. Now we will need plenty of chalk, in a variety of color. The reason for this is my use of multiple colors of fretboard also neck materials. Chalk is applied after every pass on in the sanding and machining process so you can never have enough. a radius gauge and a belt sander. Start by carefully removing wood from both sides of the fretboard and check the surface the radius gauge often. 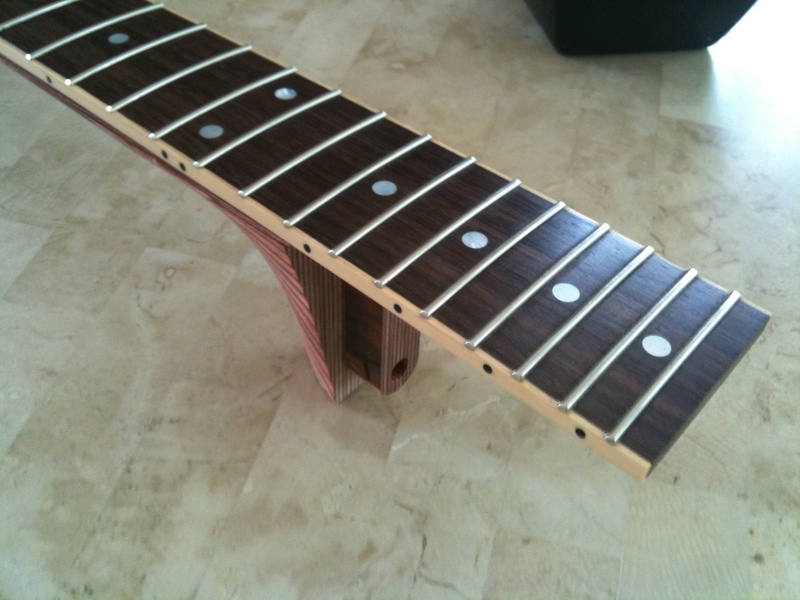 Apply more chalk on the fretboard as the belt sender removes the wood. Rock the neck back and forth over the belt sander trying to keep from removing the wood at the centerline. Using the radius block and 60 grit paper, bring the radius to match the radius template. When matching the radius, use a sanding pad approximately 3/8ths thick in your palm and rub 80 grit up and down the fretboard till smooth. This is one of the most critical parts of the neck build. The neck has to feel right in your hand. Take the opportunity to check for the correct fit in your hand often in the shaping process. In doing this, your neck will give you many years of enjoyment. The first step in the process is to belt sand the sides of the neck. The profile work we did in Stage 11) will leave the sides close but not as flat and square as we need them to be. Once they are flat and square, use the transition templates to trace the line on the back of heel and back of headstock. The lines represent the shape of the flats that have to be preserved when shaping the back of the neck. For the manual removal of stock, use an aggressive rasp file and start by long angular strokes. Using a contour gauge, press down on the back of the neck at the first fret and compare to the curve you are trying to match on the reference paper. Reset the contour gauge and take the second reading at the middle of the neck and compare to the curve you are trying to match on the reference paper. Then reset the contour gage and take a third reading at the 12th fret and compare to the curve you are trying to match on the reference paper. When you have the back of the neck close to the shape you want, use the palm sander with 40 grit sanding paper. Using long strokes back and fourth, remove the rasp filing marks and get as close to the feel you are looking for on the backside of the neck. Check out the ebook for details on how to use power tools to aid in your stock removal process. For the transitions, use the 4 in one file at the heel. For the headstock, use the round file. Shape till comfortable and flowing in appearance. It pays to have a reference neck to look at. Finish using sand paper wrapped around soft sanding cylinders.